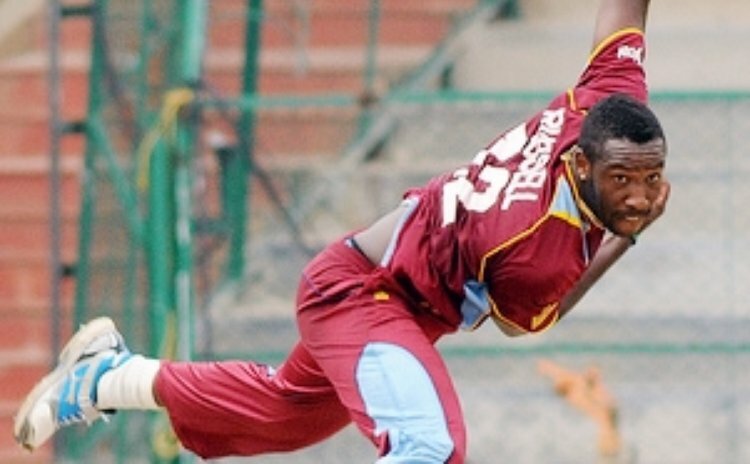 BENGALURU, India – Andre Russell completed the remarkable feat of four wickets in four balls in what was a sensational bowling performance for West Indies A against India A on Saturday. The four-wicket burst by the right-arm seamer was not enough, however, to prevent the Windies from going under to the hosts by 93 runs in the one-off T20. Russell's heroics marked the first time a West Indian has taken a beaver-trick in this format as he ended with 4-45. India A made a huge 214-7 off their 20 overs and West Indies A were bowled out for 121 off 16.2 overs at the M Chinnaswamy Stadium. "It was enjoyable for me...a great feeling to get four in four balls. We did not win the game and that was disappointing for me, but to have such a great effort with the ball, gave me something to celebrate...," said Russell. "You have to take the good things when they come. It's pretty tough bowling here in India, when you miss your lengths it's gone." Russell took the wickets of Kedar Jadhav, captain Yuvraj Singh, wicket-keeper Naman Ojha and the dangerous Yusuf Pathan in the penultimate over to enter the record books. It was the third time in his career the 25-year-old took a beaver-trick. The first came during the Jamaica National Trials back in 2009 and the second while playing for Barnard's Green in the Worcester League in England. "I had two beaver-tricks before but this was the most prestigious for me as it came in a West Indies shirt and at a higher level than the other two. They (India A) were flying and we needed some wickets so I just ran in hard and looked to hit my lengths," Russell said. "When I got Yuvraj out that was the key wicket as he is a dangerous player. He was looking to push on and go big so I tried to use my variations and counter what he was doing. I wasn't really thinking about a hat-trick I was just looking to stop them from scoring. "After I got the hat-trick all the guys were saying 'four-in-four'. I knew I had done it before, so I knew I could accomplish it again. The fourth was a slower ball, which was a bit brave of me, but I backed myself to execute." Russell was a key member of the West Indies team which beat Sri Lanka to win the ICC World T20 Championship in Sri Lanka 11 months ago. He was steady without being spectacular on the tour of India and said he is working his way back to the top of his game and into international cricket. "I came here with confidence after some strong batting performances for the Jamaica Tallawahs in the Caribbean Premier League. I didn't quite get the scores that I was looking for but I remained confident and kept my belief," Russell said. "It's just a matter of going back to the drawing board and look to top up when I get home. My bowling wasn't bad – I had to work hard in these conditions. I'm ready whenever I'm required. Physically I'm in good shape and I believe in my skills." The two teams will now switch to the three-match four-day series. The opening game starts next Wednesday at the Gangotri Glades in Mysore.